The Corsair K70 with Cherry MX Speed switches is $130 at Amazon today. One of the most beloved gaming keyboards is available at an all-time low price today. Amazon is selling a version of the Corsair K70 for $130, $50 off this particular model’s most recent price. The Corsair K70 MK.2 Special Edition features an anodized brushed aluminum frame and Cherry MX Speed switches behind its 104 keys. The more popular version—and the one that earned the K70 its reputation—packs Cherry MX Blue switches, but this is still a great keyboard. Cherry MX Speed switches have a shorter actuation point (1.2mm) than the Cherry MX Red switches that are so popular with gamers, giving them a faster reaction time under the right fingers. Corsair equipped the K70 MK.2 Special Edition with 100 percent anti-ghosting with full-key rollover for more precise key registers, white PBT double-shot keycaps, and a Windows Key lock mode to prevent mistypes that trigger the system and pull you out of the game. There’s also per-key RGB lighting for maximum customization with 8 megabytes of onboard profile storage. USB 2.0 passthrough allows you to connect peripherals directly through the keyboard. 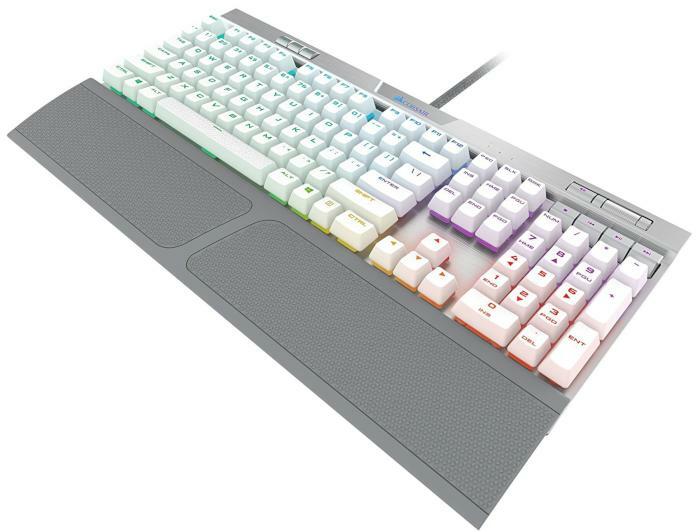 This is a killer deal, but if you want to see more options before dropping over $100 on a top-end keyboard, be sure to check out PCWorld's roundup of the best gaming keyboards.